Whip the eggs with the sugar. Melt the butter in a bain marie without frying it. Slowly add the flour to the eggs and mix with a whisk. Pour the butter and milk and mix the ingredients with the whisk. Finally, add the baking powder and mix the ingredients. Cover the batter and put it in the fridge for at least 30mins. You can also store it in the fridge the day after. Use a smallish non-stick pan for making the pancakes. Pour a bit of butter on the pan before starting with the first pancake. Pour some of the batter in the pan and cook at medium heat for a few minutes. Using a spatula lift and turn the pancake on the other side and cook it for couple of minutes as well. 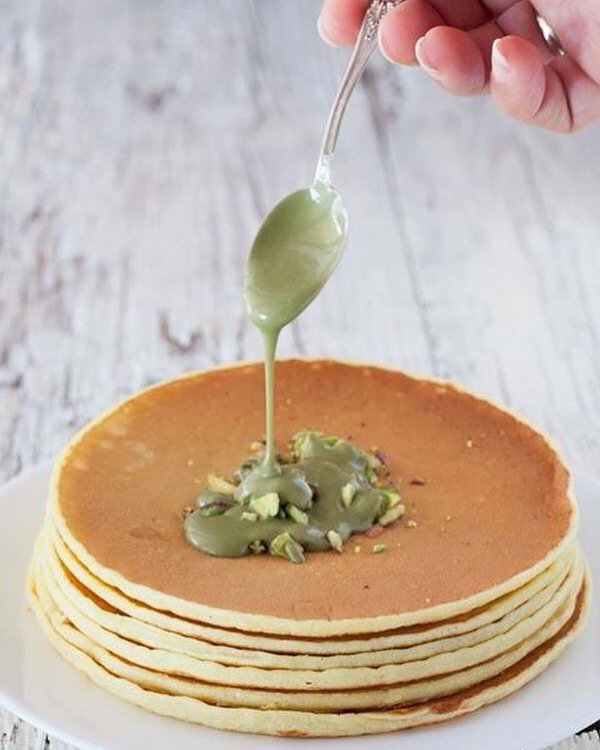 Melt the Pistachio Sweet Spread (best to do it in a bain marie as well) and pour it on the pancakes!